A history of disasters and a prediction of The Big Ones fill Dr. Jones’ book. Containing a wealth of information about the science underlying disasters, The Big Ones is written in an informal and non-technical manner. From Pompeii and Iceland’s volcanos, to California’s 1861 floods, to earthquakes in 1775 Lisbon, 1923 Japan, 2004 Sumatra and 2005 Hurricane Katrina, floods are surprisingly the most dangerous threat. Many people live through an earthquake but the subsequent tsunami’s flood waters kill them. Most victims of Hurricane Katrina died after the levees were overrun and broken from the resulting flood waters. The good news is if you live above 500 feet, there is no reason to worry about tsunamis even if you are on a cliff directly above the ocean. Born and living my entire life in Los Angeles, Dr. Jones was a familiar face on television after each earthquake. The 1971 6.5 earthquake in the valley knocked down a nearby supermarket’s roof while I watched from my bedroom window. The 1994 6.7 Northridge earthquake shook for only 7 seconds but felt like an hour. The Big One in the book is prophesied to be 7.8 to 8.2 and last 50 seconds. Since I drive literally over the San Andreas fault to work every day, the earthquake prediction was the most interesting to me. The fault slippage will leave a 20 to 30 foot trench between the Californian coast and the rest of the United States—for 250-350 miles close to parallel with the coast—adversely impacting rescue efforts. Earthquake locations can be predicted but not their timing. However, some locations are still surprising like the New Madrid Missouri earthquake in 1811 that leveled the town. 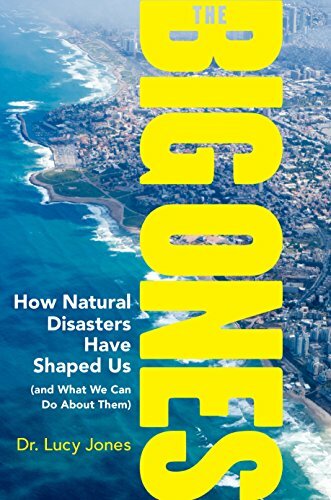 The Big Ones is recommended for all interested in natural disasters or for anyone wanting to learn from past disasters. 4 stars.